In addition, there should be rhinoscopic or CT findings consistent with chronic rhinosinusitis. The pathogenesis of chronic rhinosinusitis (CRS) is similar in some ways to that of asthma. Nasal biopsies from CRS patients demonstrate epithelial damage and basement membrane thickening (Ponikau et al. 2003). Type 2 high and type 2 low inflammatory subgroups can be detected in CRS patients (Miranda et al. 2004). Upper and lower airways of individual patients share the same inflammatory pattern (Hakansson et al. 2015). Nasal polyposis is usually associated with type 2 high inflammation (Van Zele et al. 2006, Ho et al. 2015). The prevalence of CRS in the European population is between 7-27% according to questionnaire surveys (Hastan et al. 2011). However, half of these people do not have confirmatory evidence of CRS on CT or rhinoscopy. The prevalence of CRS in asthma is higher at between 22-42%, and highest in the severe asthma population at between 35-45% (Moore et al. 2010, Radhakrishna et al. 2016). Nasal polyposis often accompanies chronic rhinosinusitis. It occurs in 2-3% of the general population (Harding et al. 1999, Harding et al. 2000). The prevalence of nasal polyposis is 4.8% in mild asthma, 9.6% in moderate, and 44.6% in severe asthma patients (Moore et al. 2007). Aspirin-exacerbated respiratory disease (AERD) also accompanies chronic rhinosinusitis and nasal polyposis. It is present in 0.5 – 1.2% of the general population (Larsson et al. 2001, Auckley et al. 2008), 7.2% of all asthma patients, and 14.9% of severe asthma patients (Tay et al. 2016). There are two subtypes of chronic rhinosinusitis, based on the absence or presence of nasal polyps. The subtype without polyps occurs twice as frequently as that with polyps. The presence of nasal polyps usually indicates the presence of Type 2 inflammation, which is not present when polyps are absent. As indicated below, nasal polyposis and Type 2 inflammation frequently accompanies asthma, particularly people with severe asthma (Tomassen et al. 2016). Simplified depiction of the clusters and their characteristic cytokines, as well as the distribution of CRSsNP versus CRSwNP and asthma. For cytokines, white indicates no increased concentration, light colors indicate moderately increased concentrations, and dark colors indicate strongly increased concentrations. Horizontal lines indicate groups of clusters, as determined by IL-5, SE-IgE, and CRSwNP and asthma characteristics. Reproduced with permissions from Elsevier, originally published in (Tomassen et al. 2016). 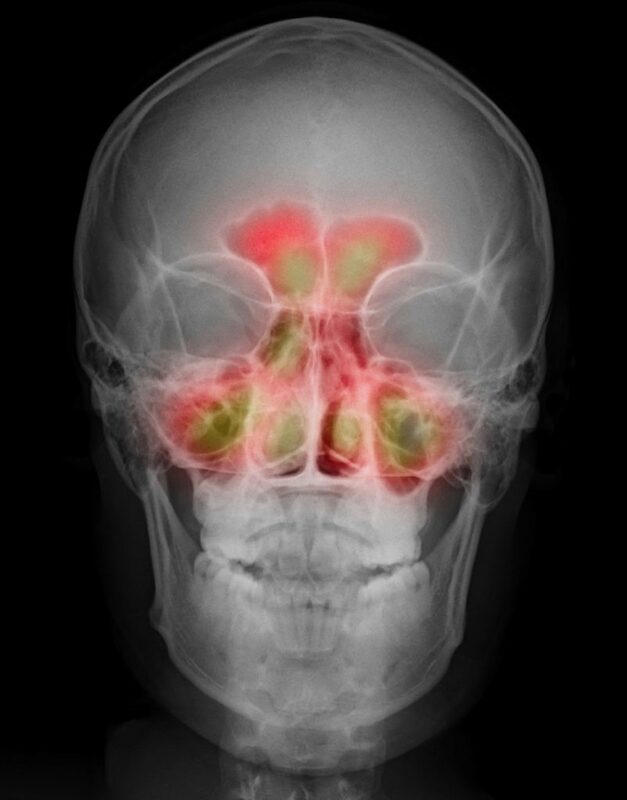 Underlying maxillary dental disease may induce chronic sinusitis. Such odontogenic disease occurs in 12% of cases. A foul discharge may provide an important clue, as patients may appear to have normal dentition. Rarely, chronic rhinosinusitis may be a manifestation of vasculitis, undiagnosed cystic fibrosis, or primary immunodeficiency. A number of reports indicate that the presence of chronic rhinosinusitis in people with severe asthma significantly increases the risk for frequent exacerbations (ten Brinke et al. 2005, Tay et al. 2016, Denlinger et al. 2017), poorer asthma control and poorer quality of life (Ek et al. 2013). Chronic rhinosinusitis has been incorporated into an asthma exacerbation risk prediction model (Loymans et al. 2016). Chronic rhinosinusitis is commonly found with obesity and depression in people with asthma (Chung et al. 2014). 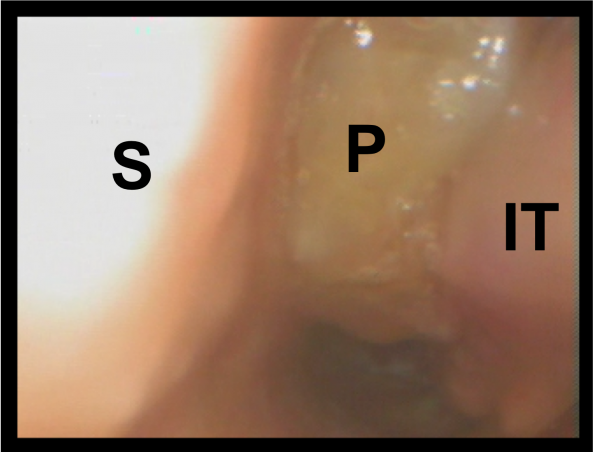 Through the mechanism of post-nasal drip, it may also trigger vocal cord dysfunction (Bucca et al. 1995). People with chronic rhinosinusitis often present with nasal obstruction, rhinorrhoea and facial pain. Anosmia is reasonably specific and differentiates chronic rhinosinusitis from rhinitis. Samter’s triad describes the presence of chronic rhinosinusitis, nasal polyposis and AERD. 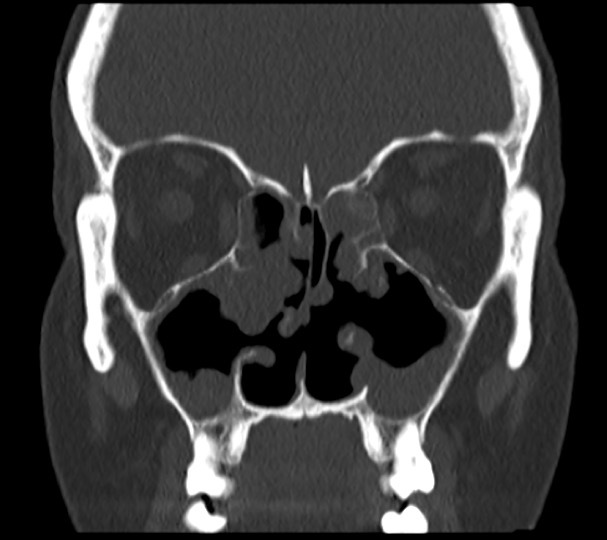 CT scanning is the most straightforward way to confirm a diagnosis of chronic rhinosinusitis. CT image indicating abnormal soft tissue density in the ethmoid and maxillary sinuses, and the roof of the nasal cavity. Antrostomies from previous extensive surgery remain patent. In addition, there is a defect in the midline septum. Image provided by A/Prof. Mark Hew, Alfred Health. Visual inspection with anterior rhinoscopy may detect large polyps, but fibreoptic nasendoscopy is required to detect smaller polyps around the osteomeatal complex. Nasal polyposis. A polyp (P) in the left nostril fills the space between the inferior turbinate (IT) and the septum (S). Image provided by A/Prof. Mark Hew, Alfred Health. A number of treatment options are available. Some studies have shown improvements in patients’ asthma control and quality of life after surgery or medical treatment (Ragab et al. 2006, Al Badaai et al. 2014, Chen et al. 2014). One study suggests that the surgery for chronic rhinosinusitis with nasal polyposis improved airflow obstruction and allowed weaning of oral corticosteroids in people with severe asthma (Batra et al. 2003). Chronic rhinosinusitis is common in people with severe asthma, affecting up to one third of patients. These patients have more frequent exacerbations, poorer symptom control and poorer quality of life. Nasal polyposis and Type 2 inflammation are usually present. Standard medical therapy, including nasal corticosteroids and nasal saline lavage, and surgery are associated with enhanced asthma outcomes. Biologicals targeting Type 2 pathways are likely to be beneficial, and results of phase 3 trials are awaited. We want to know who accesses the Severe Asthma Toolkit and how it is used. Please complete our survey. Responses will inform the continued development of the Severe Asthma Toolkit and future translation and implementation activities. Any feedback you provide will be greatly appreciated.